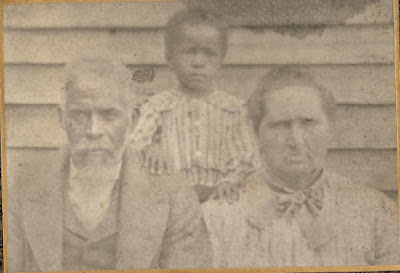 This is a picture o Mose McRae and his wife Matilda Horn with a neighborhood child. My great-great Grandfather was a Mose McRae. He was believed to be mulatto and probably born in the 1840''s. Ernest, James(Jim), John Franklin, Ed, Joseph, Emma, and Waldo. Susan Mary McRae is my great grandmother. They all lived in the Telfair, Montgomery, and Wheeler county areas. The problem is that we know nothing about Mose McRae, his parents or siblings. My cousin Jesse McRae and I are grandchildren of syblings, the children of Susan McRae who married Essex Ryals. Now for the tricky part, Jesse McRae's grandmother married an Artis McRae who is the grandson of Andrew(Andar)McRae. Now Andrew McRae had a brother named Mose. Wow! Now can you see what we were faced with, the possibility of the grandson of Andrew McRae and the granddaughter of Mose McRae, who were married to each other, could be related. We knew that Andrew McRae had a brother name Mose McRae, but we didn't know their parents; and we knew about the other Mose McRae who married Matilda Horn, but again knew nothing of his parents or siblings. Well a couple of days ago I was surfing the net and just googled the name Mose McRae and came across GenForum and a notice about McRaes of Telfair County, that was written by an Antonio McMillian. After reading this notice stating that he was a descendent of Mose McRae who had a brother name Andrew, I immediately responded because Jesse's great great grandfather is Andrew and if they could compare notes, it would hopefully confirm that this was also Jesse's Andrew McRae, and since Antonio was a descendent of Mose and from the other information given I became aware that it was not the Mose McRae that was married to Matilda Horn, and if were related to the same Andrew McRae, it would prove that grandchildren of brothers didn't marry each other. Good news, notes have been compared, and Antonio's great great grand father and Jesse's great great grandfather were in fact brothers. Even though it is good to have that bit of information and now they can continue to compare notes with one another, we are still left with no information on Mose and Matilda. This is the bittersweat part of researching your family's history, you are blessed with a bit of information that answers one question, but now you have to go back to that long list of other questions and unknowns and once again plunder through blindly, investigating various angles until you answer yet another question.